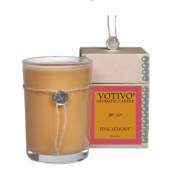 Votivo aromatic candles in Moroccan Fig transform your home into your very own paradise island. 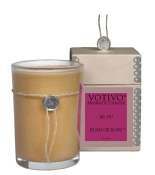 Get swept away every time you light one of Votivo's hand poured scented candles. 50 hr. burn time. 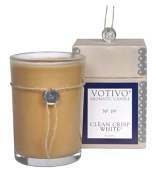 A harmonious balance of fig with notes of moroccan amber and patchouli that create an exotic and welcoming scent. Everytime i light this candle I'm taken away to Morocco..... My senses are inundated with the smell of spices from the middle east. Thisis actually my second one. The first was a gift. And I was sad when i used it up. And, it burns forever if you keep trimming the wick. Soooo its well worth the money. I use it every night next to my bed for a few hours and then i sleep wonderfully. This continues to be my absolute favorite candle of all time. 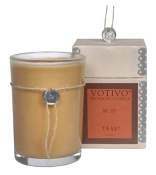 I love for my home to smell like Moroccan Fig! This is my scent for my house. Love the way it makes my house smell like a spa! I have been buying this candle for many years and it is by far my favorite. It is a unique fragrance that is not flowery. I love the way it fills my home with such a beautiful smell. I have given it as a gift and everyone says they love it. Sign-in or Create an Account to earn 140 points for this item. See Rewards Page.